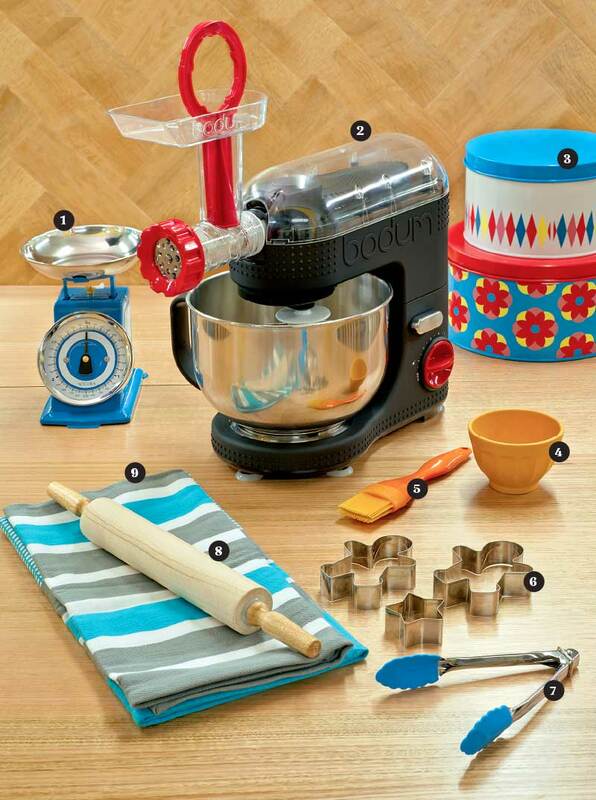 This season get baking in the kitchen with this brilliant range of colourful bakeware. 1. Kitchen scales, $29.95, from Accura. 2. Bodum Bistro stand mixer, $349, includes non-stick coated dough hook, beater, and whisk attachments. Additional meat mincer attachment (pictured), sold separately. 3. Retro cake tins, set of 2, $49.95. 4. Lemon bowl, assorted sizes, from $6.95. 5. Silicone pastry/basting brush, $9.95. 6. Ginger Bread Boy and assorted cookie cutters, from $1.95. 7. Mini silicone tongs, $12.95, from DW Essentials. 8. Easy-glide timber rolling pin, $9.95. 9. Jumbo tea towels, 2-pack, $12.95, from Ladelle.